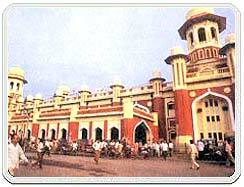 Charbagh Station, the major railway station of Lucknow , is an architectural masterpiece. The ostentatious structural design of Charbagh Railway Station enthrals a tourist at the onset. Built at a whooping price of Rs. 70 lakhs, it was designed by J.H. Hornimen. The foundation of the Charbagh Railway Station was place by the Bishop, in March 1914.